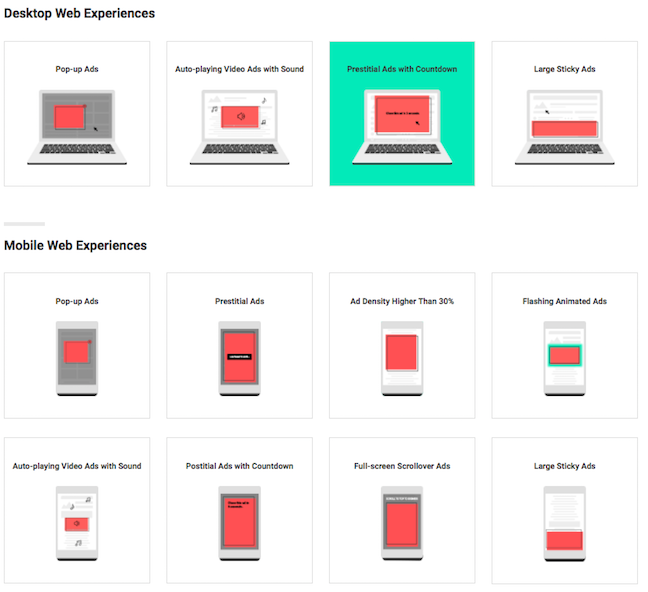 From February 15, Google's Chrome browser will begin zapping ads that don't conform with new taste guidelines. But what those guidelines mean exactly is anyone's guess. Google confirmed that blocking would begin in a developer blog post. Google is a member of the Coalition for Better Ads – a group launched last year to represent digital advertising businesses including Facebook and big brands. "In line with the Coalition's guidelines, Chrome will remove all ads from sites that have a 'failing' status in the Ad Experience Report for more than 30 days," Google wrote. The Coalition has identified 10 types of ad nasties, four on the desktop and six on mobile, as part of its Better Ads Standards guidelines. Some practices have been around almost as long as web advertising – like pop-ups and flashing graphics. But loopholes will allow other unpopular practices to continue. For example, the Coalition frowns upon one category: the poststitial ad with a countdown. This is a timed advert that restricts the user from viewing content until the countdown has expired, or the ad has been manually dismissed. But these are not banned under the Better Ads Standards, as long as the advert can be manually dismissed. The 12 classes of sinning advertisements identified in the Better Ads Standards (BAS). But don't bet on them being blocked. As for the universally unpopular autoplay video ads, which can savagely eat into a mobile user's data allowance, the BAS kicks this into the long grass. In an advisory note (PDF) issued in September, the Coalition acknowledged that the final standards haven't been agreed, and what has been agreed contains ambiguities: "matters of interpretation of the Standards may arise." News of Google building an adblocker into Chrome emerged earlier this year. It was viewed as a response to Adblock Plus maker Eyeo's Acceptable Ads Committee, which also sought to define taste guidelines for digital advertising. The AAC has now spun out into an independent organisation. Eyeo markets AdBlock Plus and permits "acceptable" ads to be displayed in its "whitelisting" solution. M&C Saatchi has a seat on the AAC but the initiative has been largely shunned by brands and other agencies. "They [Google] call it ad filtering, but that's the ad blocking we've been propagating for years," Eyeo comms chief Ben Williams told us last month. "To see that go mainstream is heartening." Far more than Chrome, it is Apple that is causing the ad industry sleepless nights. Apple has introduced ITP, or Intelligent Tracking Protection, which purges third-party cookies from sites that track you, but that you don't visit. Webmasters who fear they'll flunk the BAS test can go here to see if they are offering an "abusive experience".